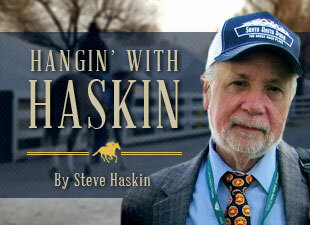 The following is the Derby preview article that will appear in the Feb. 12 issue of the The Blood-Horse. But before we get to that, let’s try something different this year. Debuting this week is the Derby Dozen. But what are the chances even half of those horses listed will even make it to Churchill Downs? And what are the chances the Derby winner is among them? What I’m going to do is issue a challenge – to myself. For this week only I’m going to pick a second Derby Dozen, made up of lesser-known, mostly non-stakes horses who have looked impressive, and see how these horses stack up against the Top 12 come the first Saturday in May. Call them the Future Book Potential Overlays And Only Value Horses. These horses will be discussed in detail in the weeks to come. The list is as follows: 1) Casper’s Touch, 2) Elite Alex, 3) Alternation, 4) Awesome Patriot, 5) Washington’s Rules, 6) Rustler Hustler, 7) Tiz Blessed, 8) Sway Away, 9) Machen, 10) Crossbow, 11) Beamer, 12) Heron Lake. So, let’s see if the diamonds in the rough wind up shining brighter than the glittering gems that are already on display. Others to keep an eye on are: Bert B Don (watch out when he goes two turns), Cool Blue Red Hot, El Grayling, Fort Larned, Leave of Absence, Lumberyard Jack, Manicero, Nacho Business, Runflatout, San Pablo, Sovereign Default, Supreme Ruler. I wrote last week that Casper’s Touch would be in the first Top 12, and discussed him extensively, but too much has happened since then, and room had to be made for the more proven stakes horses. But he definitely is one to watch and should show up in an allowance race next weekend. Also, watch out for Elite Alex, who could be something special. His last was a phenomenal performance in defeat, in which he was narrowly beaten by a very good horse despite a nightmare start. You have to love his 3x4 inbreeding to Nureyev. His tail-female family traces to Kentucky Derby and Preakness winner Majestic Prince and French Derby winner Caracolero, and his fourth dam, Natashka, won the Alabama and was named Broodmare of the Year in 1981. OK, what kind of food are you looking for to sustain you as you make your way on that long, arduous Kentucky Derby trail? You know you’re going to get hungry along the way. How about a bag of corn and rice puffs, washed down with a bottle of Vitaminwater? If not, there’s always a nice hot bowl of chicken noodle or cream of mushroom soup. Perhaps you have a sweet tooth and crave a fresh warm glazed donut. In other words, do you like Uncle Mo, To Honor and Serve, or Tapizar? Perhaps the owners of those horses – Mike Repole of Pirate’s Booty and Vitaminwater fame; Charlotte Weber, director of Campbell soup; and the family of the late Verne “The Donut King” Winchell – can get together and lay out a tasty smorgasbord for all the weary travelers on their way to Churchill Downs. Alright, that’s enough food metaphors, especially after Dialed In looked so impressive in the Holy Bull Stakes (gr. III) and owner Bob LaPenta’s only connection to food that we know of is enjoying a meal at Sergio’s after the races at Saratoga. After so many years of writing Derby preview stories, you start looking for any opening angle you can get, as feeble as it might be. We have seen enough action at Gulfstream Park, Santa Anita, Fair Grounds, Oaklawn Park, Golden Gate, and Aqueduct to get some kind of idea where this 3-year-old crop might be headed. Of course, almost every horse that has run so far, no matter how impressive he’s looked, is going to avoid the Repole roadblock that is already being set up at Tampa Bay Downs (in the grade II Tampa Bay Derby) and Aqueduct (in the grade I Wood Memorial). No use heading smack into “Mighty Mo” before you reach Churchill Downs. If last year’s undefeated champion juvenile, Uncle Mo, comes out breathing the same fire he did last year in his three eye-popping performances, an early confrontation with him could very well result in a detour from Louisville to Baltimore. We are all aware of Uncle Mo’s meteoric rise to stardom, from his other-worldly maiden victory, which he won by 14 1/4 lengths and earned a lofty 102 Beyer speed figure, to his 4 3/4-length Champagne (gr. I) score, in which he set a scorching pace and still came home his final quarter in :24 flat, to his tour-de-force in the Grey Goose Breeders’ Cup Juvenile (gr. I), easily defeating the brilliant Boys At Tosconova by 4 1/4 lengths, earning a 108 Beyer figure. Many feel if there is a chink in his armor, it is his pedigree. His sire, Indian Charlie, who won the Santa Anita Derby (gr. I) and finished third in the Kentucky Derby (gr. I), is not known for siring true distance horses, but is more than capable of it with the right female family, as evidenced by his daughter, Fleet Indian, winner the 1 1/4-mile Personal Ensign (gr. I) and Delaware Handicap (gr. II), and he’s had a number of nine-furlong stakes winners. Indian Charlie’s sire, In Excess, set a track record for 1 1/4 miles at Belmont Park, winning the Suburban Handicap (gr. I) in 1:58 1/5. Uncle Mo’s broodmare sire is Arch, who sired last year’s Breeders’ Cup Classic (gr. I) winner Blame. A more comprehensive look at his pedigree can be found in this week’s Pedigree Profile in Blood-Horse magazine. Does Uncle Mo have a great pedigree for 1 1/4 miles? No, not great, but supposedly neither did Smarty Jones and Big Brown, who both proved that brilliance and raw talent can carry you a long way on the first Saturday in May. And he certainly has enough stamina to suggest that won’t be as much of a problem as some think. Repole and trainer Todd Pletcher do have a 3-year-old with a pedigree to not only get the Derby distance, but the Belmont Stakes distance as well. Any owner would be grateful to have a second-stringer like Stay Thirsty as his or her first-stringer. Stay Thirsty, a son of Bernardini, out of a classy, stamina-laden King Ranch family broke his maiden impressively before finishing second to Boys At Tosconova in the Hopeful Stakes (gr. I), setting all the pace and hanging tough in the stretch. This horse does not want to be on the lead. He came from off the pace in the Breeders’ Cup Juvenile, his first start around two turns and first start in two months, and was looming dangerously on the far outside turning for home, but ducked in badly from a right-hand whip and cut across four or five horse paths before finally getting straightened out. He backed out of it after that and finished a well-beaten fifth. It will be interesting to see what he does this year with maturity and stretching out to longer distances. Many of those who do not see Uncle Mo as a Kentucky Derby horse are turning to the Bill Mott-trained To Honor and Serve, who has won his last three starts impressively, including wire-to-wire victories in Aqueduct’s grade II Nashua and Remsen Stakes. Another son of Bernardini, he’s already won going 1 1/8 miles and is bred to run farther than that. The Fountain of Youth (gr. II) is his target at this point. Uncle Mo, Stay Thirsty, and To Honor and Serve all are going the conservative route, with only two starts before the Derby. As much as that schedule has always been frowned upon, it has produced the last four Derby winners, so times apparently are changing. Of the horses that have run this year, the standouts are Tapizar and Dialed In. Tapizar made a gigantic leap from his first three starts, which showed no indication of what was to come, to a monster 10 1/2-length maiden score at Churchill Downs followed by a comfortable 4 1/4-length victory in the Sham Stakes (gr. III) at Santa Anita. In his second start, he stumbled at the break, unseating his rider. In the maiden win, he ran more than a full second faster than the grade II Kentucky Jockey Club Stakes the race before. And in the Sham, he ran more than a full second faster than the grade II San Fernando Stakes for older horses on the same card. That is the sign of a good horse. Tapizar, a son of Tapit, trained by Steve Asmussen, has an effortless way of moving, changes leads smoothly, and seems to do everything like a pro. As the expression goes, he floats over the track. His pedigree goes back several generations of Verne Winchell breeding. His second dam, Call Now, won the Del Mar Debutante (gr. II) and is a half-sister to one of Winchell’s best horses, Olympio, who won four Derbys and earned over $1.4 million. Call Now also is a half-sister to the dam of one of Winchell’s fastest horses, Cuvee, winner of three graded sprint stakes. Asmussen has another highly regarded Derby hopeful is Astrology, winner of the Iroquois Stakes (gr. III) and second in the Kentucky Jockey Club Stakes (gr. II). Expect the son of A.P. Indy to show major improvement at 3. It looks like he’ll point for the San Felipe (gr. II). With his 2-year-old foundation he won’t need more than two solid two-turn stakes under him. As for Dialed In, the son of Mineshaft, trained by Nick Zito, most certainly was dialed in for the Holy Bull Stakes. Coming off only one career start, an out-of-the-clouds nose victory going 6 1/2 furlongs at Churchill Downs, he was forced to run in the Holy Bull against seasoned stakes horses after being scratched from an earlier allowance race because of a sloppy track. But it was he who looked like the seasoned stakes horse, coming from last and blowing away his opponents in the final furlong. And he did it with final fractions of :23 3/5 and :24 flat, despite not changing leads until the sixteenth pole. Under Julien Lepararoux, he won going away by 1 1/2 lengths and covered the mile in a sharp 1:35.19. For this colt to do what he did against this field, he has to special. And what was most impressive was the way he dropped his head and leveled off, unveiling a big, beautiful stride that covers a lot of ground. Dialed In’s second dam, Eliza, was champion 2-year-old filly after winning the Breeders’ Cup Juvenile Fillies (gr. I), and captured the Santa Anita Oaks (gr. I) at 3, while placing in the grade I Santa Anita Derby and Kentucky Oaks. As for the others, Sweet Ducky (second) and Gourmet Dinner (third) both ran their usual solid races, but Mucho Macho Man, of whom much was expected, was way too keyed up early, battling on the lead, and that cost him any shot of winning. He ran well enough, finishing fourth, to suggest improvement in his next start, presuming he settles and takes back. The Holy Bull was supposed to feature Hopeful winner and BC Juvenile runner-up Boys At Tosconova, but the day before entries, trainer Rick Dutrow decided not to enter the son of Officer, because he didn’t like the colt’s energy level. A flat mile would have been a good spot for him. It’s not going to be easy now to find a suitable race that’s not at 1 1/8 miles. The other alternative would be send him out of town, perhaps for the 1 1/16-mile Sam F. Davis (gr. III) at Tampa Bay Downs…assuming his energy level is where Dutrow wants it. A good deal of talk this winter has been about the white-hot streak trainer Bob Baffert is on, especially in stakes competition. Baffert has an interesting mixture of 3-year-olds, headed by Zayat Stables’ Norfolk Stakes (gr. I) winner Jaycito, who cost himself any shot of winning or even finishing in the money in the Breeders’ Cup Juvenile, when he inexplicably swerved and ducked out to the middle of the track. Trained last year by Mike Mitchell, the son of Victory Gallop was turned over to Baffert, who has worked on some of the colt’s issues and is hoping to run him in the Robert B. Lewis Stakes (gr. II). Most of the talk in Baffert’s barn has been about The Factor, a son of the sprinter War Front who dazzled everyone with his spectacular maiden victory at Santa Anita Dec. 26, winning by 8 1/4 lengths in a track-record 1:06.98 for six furlongs. Baffert has been trying to harness some of the colt’s incredible speed, and we won’t know much more about him as a Derby horse until he stretches out in distance. He is scheduled to run next in the Feb. 20 San Vicente Stakes (gr. III) at seven furlongs, so he’ll have only two opportunities at two turns. Baffert also has a live one in Awesome Patriot, a son of Awesome Again, out of Tiznow’s full-sister Tizamazing, who showed a lot of guts, out-battling a hard-knocking stakes horse in Riveting Reason in a one-mile allowance race Dec. 29. But when it comes to big-name trainers, Todd Pletcher is really loaded. In addition to Uncle Mo and Stay Thirsty, he has Super Saver’s undefeated half-brother, Brethren, who is two-for-two, and several of the horses he has beaten have come back to win, including Black N Beauty. Pletcher, like Baffert, also has several other highly regarded colts waiting to emerge on the scene. Three of them – Fairview Heights, Hammersmith, and San Pablo – all look ready to break their maidens next time out. Kenny McPeek has three potential Derby horses in Rogue Romance, third in the BC Juvenile, and impressive last-out winners Casper’s Touch and Washington’s Rules. All three have the pedigrees and the right running style. Other horses who have proven themselves in stakes company include CashCall Futurity (gr. I) winner Comma to the Top, the former claimer who has won five straight, but has never run on dirt; Kentucky Jockey Club winner Santiva, who hopes to finally find a permanent home in Eddie Kenneally’s barn; Del Mar Futurity (gr. I) winner and CashCall Futurity runner-up J P’s Gusto; Breeders’ Cup Juvenile Turf (gr. IIT) runner-up Soldat, who romped by 10 3/4 lengths in a 1 1/8-mile allowance race in the slop; Lecomte (gr. III) winner Wilkinson; California Derby and Gold Rush winner Positive Response; and Hollywood Prevue (gr. III) winner Premier Pegasus, who hasn’t been seen in a while, but is back on the work tab, drilling a sharp half in :47 1/5.